Make sure you fulfill all registration requirements before making your application to become a member. All applicants trained in the UK by the Medical Ozone Research Institute and hold a valid Medical Ozone Course Certificate. All Non-UK applicants must be trained by an approved Training Facilitator and Authorized Training Centre recognised by the Ozone Society. Applicants should be aware that may also require a valid Medical Oxygen Handling Certificate. Applicants that have not completed their training from an Authorised Training Centre recognized by the Ozone Society, must meet the equivalent training standards set by the Ozone Society. Applicants are expected to complete and pass examinations for theory and practical in medical ozone. Valid Certificate of Professional Indemnity Insurance for the practice for Medical Ozone Therapy. Valid Certificate of Public Liability Insurance. 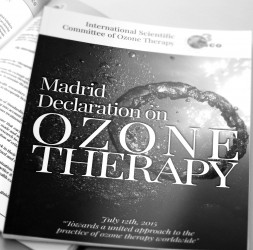 Insurance Certificate must indicate which Methods of Ozone Therapy the practitioner is covered to practice. Medical Ozone Practitioners that come from a complementary medicine background are required to carry the seal of the Ozone Society on a valid Medical Oxygen Handling Certificate. This verifies the practitioner is health and safety compliant to handle medical oxygen gas cylinders, in thier practice or clinic. This certificate is renewed annually. All members are given the seal of the Ozone Society. This establishes the verification that the practitioner has achieved the required qualification and training to practice Medical Ozone Therapy and complies with full membership regulatory requirements set by the Ozone Society. The seal also provides exclusive access to discounted indemnity insurance premiums, client referral services and advertise thier services on the ozone society "Registered Members" page.